Count on excellent veterinary care with our medical, surgical, and dental services, plus boarding and grooming. Meet the team that's been serving Southern Maine for decades. You'll discover why we have quite a following. This video, taken by a client to share the story of a beloved pet named Obi, shows how genuine care and concern – from pet owners and caregivers alike – can lead to some magical outcomes. 2. Special perks for new and established clients. If you're a new client, you'll receive $15 OFF your first visit by mentioning our website. If you're an established client — refer a friend and get $15 OFF your next visit! And, "LIKE" us on Facebook to see the latest pet-related news, special deals and offers, silly photos, and more. 3. 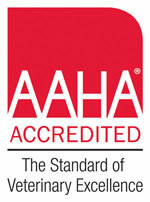 AAHA accreditation: you can always expect progressive, savvy veterinary care. Only the top 15% of practices in the U.S. and Canada achieve the industry's highest performance rating — and Falmouth Veterinary Hospital has held this distinction since 1951 (the first in Maine). We're re-evaluated every 3 years. 4. Greater Portland's largest veterinary team – and the best by reputation. Meet the 6+ Falmouth, Maine veterinarians and medical team you'll know and trust, who know you, and who will devote the time and attention to help your pet. We're large enough to handle the toughest cases, yet small enough to provide care on a personal level. 5. Convenient location with no Portland traffic issues. You'll appreciate getting top-notch veterinary care just north of Portland, Maine, with easy access from Falmouth, Cumberland, Yarmouth, North Yarmouth, Freeport, Pownal, New Gloucester, Westbrook, Gorham, Portland, South Portland, Scarborough, and Cape Elizabeth. 6. We welcome dogs, cats and smaller furry pets! 7. Review your pet’s immunization records, medications and more with our app, PetPage! Access your pet’s health resources when you need them most, and with the additional PetPage features: requesting medication refills, scheduling appointments or setting reminders for giving preventatives — you'll find everything you need to help keep your pet as healthy and happy as possible. 8. Count on us for dog grooming, too. We offer Greater Portland dog grooming services, from bathing and simply combing out mats to making your pet look like the pride of a show ring, our groomers will work with you to deliver the results you want. You can also rest assured that your pet will be treated with the utmost care and kindness throughout the visit. Contact us to book your grooming appointment. New Clients - Receive $15 OFF Your First Visit by Mentioning Our website.Established Clients - Refer a Friend and Get $15 OFF Your Next Visit! Sign-up using the form or call us at 207-781-4028 to take advantage of this exclusive offer.